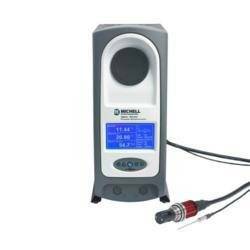 The new Michell S8000 remote hygrometer is among the most precise instrument currently available for emissions testing and can be used as a primary measurement and control device in the emission testing system or to verify calibration of other devices. The S8000 will help meet requirements for absolute or relative humidity measurement of environmental control authorities. During an emission test, the control of ambient conditions plays an important role in the outcome. Among other values such as temperature or pressure, the relative humidity has to be measured to comply with defined EPA standards. The evaluation of emissions during engine design requires the use of climate-controlled emission testing systems such as test chambers and cells. With accuracies of +/- 0.1°C dew/frost point, and based on a fundamental measurement principle which has no inherent drift, the new S8000 Remote chilled mirror hygrometer, combines flexibility with outstanding accuracy. Every Michell instrument is delivered fully calibrated and traceable to National Standards, including the S8000 Remote. Michell maintains direct traceability to NPL (London, UK) and NIST (Washington DC, USA) through our UKAS accredited Humidity Calibration Laboratory. This satisfies the most stringent quality system requirements and gives ultimate confidence in the measurement being made.